To host the Eastern European Regional Veterinary Conference (EERVC) in the upcoming years, we are pleased to provide you with further background information. Bid document has been prepared to provide you with a clear understanding of the scope and responsibilities involved in hosting the EERVC. It is expected to attract approximately 1500 delegates. Exhibiting area up to 1000sqm. The EERVC Board has indicated that the first three weeks in October are the ideal choice, during three (3) days, Thursday-Saturday and a pre-conference day – Wednesday. You may propose alternative dates for the conference if necessary. These alternative dates should be within two weeks of the corresponding option date. All competing cities will be required to respond to bid documnet. That will allow the EERVC Board to assess bids on a common platform and to compare costs, quality and range of meeting facilities and hotel accommodation offered. The bid documentation will be sent thereafter. 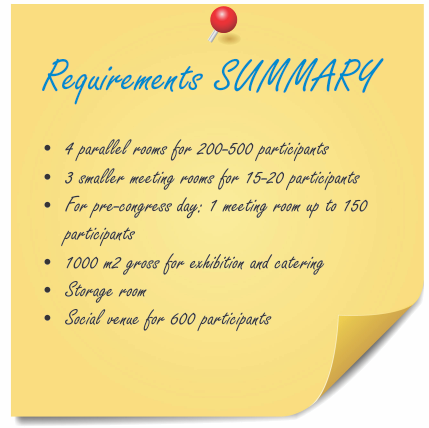 If you have any questions, please contact the EERVC Office at eervc@congrexpo.co.rs.